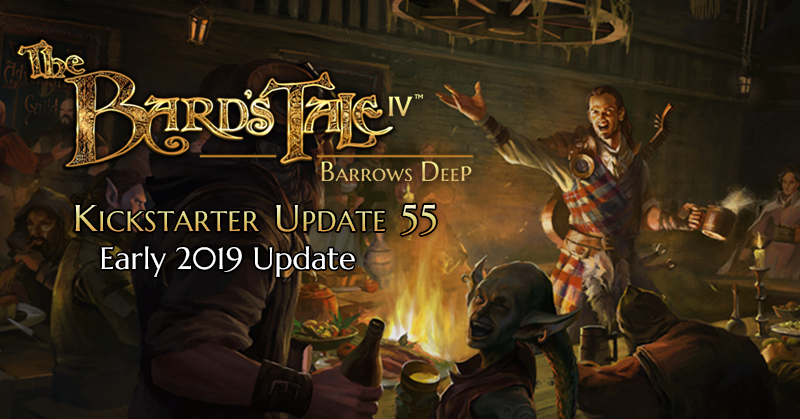 In the latest The Bard's Tale IV: Barrows Deep update, we announce our Director's Cut and provide a timeline on its arrival, as well as the Mac & Linux versions. Check it out at the link! We are still in development on the free DLC patch, which also includes a number of other player-requested features and items off of our own post-release support list. As the scope of the patch has expanded (and continues to), we decided that it warranted a more formal title than 2.0. When released, it will turn the game into “The Bard’s Tale IV: Barrows Deep - Director’s Cut”. All that and more in the link above! Enjoy! Nice read! It sounds like a good procedure outline. But, my biggest hope is that this is only the first update you´ll give and we´ll see other updates for the rest of your work in the coming days. What happened in development that this isn't the first release? Why did you send us supporters a broken, incomplete product. You only get one chance at a first impression and it was blown by something that clearly didn't stand up to any scrutiny. It was promised to have Mac and Linux support, not a year after release but with the release. Also you're "expanding the scope" of this patch. How does that help us backers. It sounds like the original project all over again! You've over promised in the past. Why should we trust you now over this? Above we can see a typical example of self-entitlement and whining. Inxile gives us a large dlc for free and assures they will stay commited on the promises made as best they can, even when they've been bought by MS, but yet some keep complaining. What happened in development that this isn't the first release? Why did you send us supporters a broken, incomplete product. You only get one chance at a first impression and it was blown by something that clearly didn't stand up to any scrutiny. It was promised to have Mac and Linux support, not a year after release but with the release. It helps us backers in that we've already paid for the game and won't be charged for the major patch-overhaul they are doing--just like CDPR or Larian, etc. They are changing many fundamental features of the game, btw! Did you even read the KS update? Some things were asked for by players--others they are doing because they want to further improve their games after they ship--just like CDPR and Larian, to name them again. Sure beats me why someone would complain about that. As a backer, I feel we are really getting our $ worth. Backer's also get the really terrific remake of the BT Trilogy, etc. Free. Non-backers must pay. Why should we not trust them?... ;) Of course we should "trust" them--what they've announced is far superior to just dropping BTIV where it is and moving to something else, imo. Which is something that, again, many developers *do*! Those are the people I don't trust! I get you are miffed because you wanted either a Linux version or a Mac version--you don't say which. But as I mentioned earlier, you should be quite used to a waiting game there, because the wait for ports of those Windows games can be years or you'll never get them at all. You could, of course, think about dual-booting with Win10x64, so that you could be sure to get these games when they first ship, couldn't you? Don't blame InXile for your choice of OS. In terms of gaming, to coin an old phrase, "Windows is where the action is," for developers and end users who *play games. * InXile is a game company--not an OS-promotion company, etc. They'd have to have rocks in their heads to do that, imo...;) That's why they've said it's not going to happen. Tired of waiting and playing second-fiddle for Linux or OS X games? Then dual-boot--or else get an a Windows emulator and see how that works for you. I'd advise the dual boot, myself. But those are your choices, atm. As a backer I am a bit disappointed that I have to wait for June for BTIV because I want it now--yessssss, I want it...;) But this is the way the cookie sometimes crumbles--a wiser, better man than me once said, "In your patience you possess your soul." It's worth at least your consideration. I expect that everything is going to turn out just fine. You only get one chance at a first impression and it was blown by something that clearly didn't stand up to any scrutiny. My guess is that they're going to try selling this "Director's Cut" as a separate product so that it can get separate reviews. They're probably hoping that people who were not impressed with the initial release won't be bothered to write negative reviews for the new one. They seem to be a very inexperienced group of developers. Between not having much community engagement and being disconnected from the game's core audience to expanding project scope after failing to get the basics right, it is really quite telling. Maybe with some help from Microsoft, they'll do better with this "Director's Cut", but I'm not going to hold my breath. I get you are miffed because you wanted either a Linux version or a Mac version--you don't say which. But as I mentioned earlier, you should be quite used to a waiting game there, because the wait for ports of those Windows games can be years or you'll never get them at all. That might be the case in general, but NOT when inXile promised a Linux/Mac version in the Kickstarter, and people gave them money in advance expecting to get a Linux/Mac version without being second-class citizens (especially since with WL2 and TTON we got the Linux/Mac versions on day 1). Dual booting is not an option for me. First I would need to buy a Windows license, why should I have to ? Then I'm a very busy person, and when I play games I multitask - read email, browse the web, do some stuff in parallel, sometimes even "light work", especially doing load times, but not only. That's definitely not an option if I dual boot. And finally, part of why I use Linux is because I don't want to maintain a Windows, which is a lot of hassle between virus and antivirus, heavy and painful drivers, inexistent package manager so you need to keep every single application up-to-date separately, internal tendency to bloat and self-destruct, ... And then there are all the privacy issues of Windows 10. If inXile doesn't make want to make a Linux or Mac version, sure it's their choice, but then I won't back them, buy their game, spread the word about their games, ... but when they promise a Linux and Mac version in the KS pitch, and then take many months to actually deliver it, I legitimately feel frustrated. But then I'm also full of understanding for inXile being (until recently at least) a small studio, and operating under tight budget and manpower constraints, so as long as they actually deliver a Linux version in a reasonable timeframe, I'll forgive them, and continue supporting them as long as they continue making Linux versions. Which I fear won't happen anymore, but that's another story. Thanks for the heads up! Won't be playing it, because I'll be busy playing the BT3 Remaster and other good games, but it's nice to know that people with Linux, Mac, PS4 and Xbox will be able to look at it soon and play with a controller to boot! Do the new portraits include male elves, female dwarves, etc (with their associated models), or is it a Bill Gates skin for the bard? Who wouldn't want one? The puzzle skipping song sounds good, we only need a new song for skipping combat now (Mangar's Mallet comes only in mid game), so we can "enjoy the game". ZiN! Happy New Year! Glad to see that you're still around. Agree on the above. As long as we're tossing out ideas, I think they should also add an intro skipping song, so we can get right to making a party of 6 characters and don't have to watch a bunch of inquisit*cough*paladins hanging and immolating people while driving a premade character.